We are dedicated to innovative and diverse methods of professional education. Our faculty is committed to supporting collaborative, inter-disciplinary research opportunities for faculty and students at the undergraduate and graduate level. The School of Nursing at UBC’s Okanagan campus provides students with an essential understanding of people within the context of health and healing. Recognizing that the health challenges of our day transcend borders, the School of Nursing continues to increase the capacity of students, faculty, and alumni to engage internationally. In addition to vital partnerships with our health region and our Okanagan communities, our students and faculty are active global citizens who work with colleagues in Ghana, Zambia, Brazil, and India. The School of Nursing is dedicated to creating rich opportunities for international engagement for students, faculty, staff, and alumni, and collaborates and communicates globally. The School of Nursing builds on successes with its latest partnership with three of Brazil’s top nursing schools: the Universidade Federal do Rio Grande do Sul in Porto Alegre, the Universidade de São Paulo in Ribeirão Preto, and the Universidade Federal Rio de Janeiro. 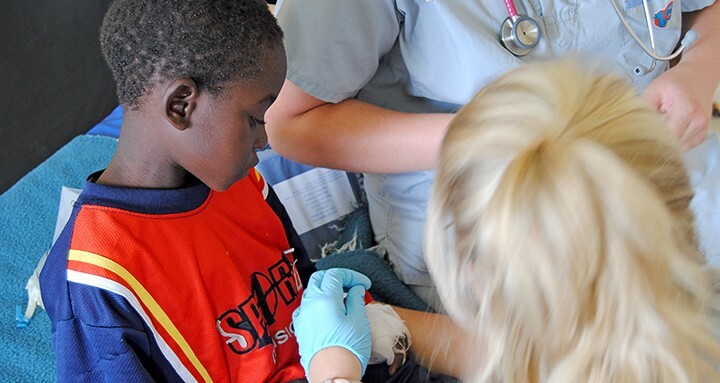 Global Health provides undergraduate Nursing students with opportunities to work with diverse populations both nationally, within rural Canada, and internationally, in low- and middle-income countries. Global Health is a course, NSRG420, offered within the undergraduate program. Find out more at the Global Health website. The Global Gala is a charity event hosted by nursing students who are passionate about global health. Twelve years ago, UBC Okanagan nursing students started participating in a global practicum in Ghana, and more recently Zambia. The Global Gala aims to build community capacity regarding global health, increase awareness about the impact nurses have both locally and internationally, and to raise funds for health care initiatives and supplies. Find out more at the Global Gala website. Recognizing our role in promoting student success, during and after studies, the School of Nursing continues to increase capacity for enriched educational experiences. The School of Nursing at UBC’s Okanagan campus is a highly respected program providing nursing students with the skills they need to deliver outstanding health care within an increasingly complex health care system. Students experience an intimate, student-centred classroom environment while developing an essential understanding of people within the context of health and healing. As outlined in Place and Promise: The UBC Plan, the School of Nursing serves to carry out UBC’s commitment to transformative student learning. Recognizing the potential of an innovative teaching opportunity, the School of Nursing launched the Human Patient Simulator Program in 2007. Human patient simulators are complex, computerized human replicas that can blink, speak and breathe. A human patient simulator can replicate a male or female patient, has a heartbeat and a pulse, and imitates changes in patient status in real time. Under the control of a qualified nursing trainer, human patient simulators accurately mirror human responses to medical procedures such as intravenous medication, cardiopulmonary resuscitation, and the insertion of a catheter or chest tube. Beginning with one adult simulator, the School of Nursing’s training program now includes a child simulator, a maternal simulator, and an infant simulator. The School of Nursing’s priority is to enhance the quality and and impact of teaching for all students. In 2015, the School of Nursing introduced transformational changes to our BSN and MSN programs. In May 2015, our flexible delivery MSN program began with a ten day residency at our beautiful campus, followed by eLearning courses that enable graduate students to study where they live and work. In September 2015, the school launches Year 1 of our revised BSN program which offers increased emphasis on intentional learning practice experiences, new inter-professional health care ethics curriculum, and senior specialty electives. The revised BSN program will be the first nursing program to include mindfulness in its curricula. Recognizing its role as a partner, the School of Nursing continues to dedicate its resources to dialogue and action on issues of community priority. The School of Nursing exists for the communities it serves. Faculty, staff, and students work to strengthen an understanding of community interests in community service learning, and “action research” opportunities.